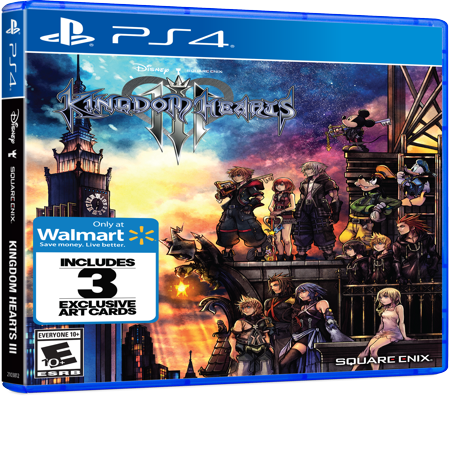 Walmart Exclusive: Kingdom Hearts 3 comes with a FREE set of Collectible Art Cards with the purchase of any box edition. A mature Sora sets out on a new adventure. 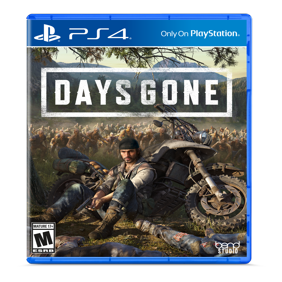 The title will make full use of next-generation console technologies to deliver more exhilarating, action-packed gameplay and various fun features. As a culmination of the series so far, Kingdom Hearts III is shaping up to be an entertainment experience with a grand story of unparalleled scale. Having learned that all the conflicts surrounding "Kingdom Hearts" were a part of Master Xehanort's master plan to cause a Keyblade War, Sora and his friends search for the seven guardians of light to combat the darkness. While King Mickey and Riku set off in search of previous Keyblade wielders, Sora, Donald and Goofy visit various Disney worlds in search of the "Key to Return Hearts." Walmart Exclusive - Free set of Collectible Art Cards with purchase. Combines worlds of Disney and Final Fantasy. Sora returns with Donald Duck, Goofy, King Mickey and Riku to stop Master Xehanort's plan. New "Attraction Flow" attacks incorporate Disney Parks attractions. Feature worlds based on new Disney properties including Tangled and Big Hero 6. Adventure in Disney and Pixar Worlds - Embark on an adventure that spans the Disney universe: Travel across Disney and Pixar worlds to protect them from the Heartless invasion, and befriend and join heroes from Toy Story, Monsters, Inc., Big Hero 6, Tangled, Hercules, and more! Unlock the Power of the Keyblades - The mysterious and powerful Keyblades can now transform into additional forms with new abilities, moves, and animations. Equip multiple Keyblades and combo between them to unlock spectacular attacks! Experience the Magic - Cast visually stunning, powerful magic spells to battle the Heartless. Call upon Disney-Pixar friends and partner with them for support. Turn the tide of combat by summoning all-new "Attractions" inspired by the theme parks. Thrilling and Action-Packed Battles - Explore and interact directly with the Disney-Pixar worlds. Fight off swarms of Heartless while scaling massive cliffs, diving deep underwater, or even freefalling through the air. Experience unique gameplay elements custom designed for each new world! Relive Classic Disney Shorts Through Minigames - Take a break from saving the world with over 20 minigames inspired by classic Disney short films. SO MUCH FUN! I love everything about the game, from the characters to the adventure. Highly recommend. Great game, you get around 50 hours of gameplay and wonderful graphics. Only downfall if you are new to kingdom Hearts series, the story would be a little confusing.